In the 2014 European elections (they seem an age ago now), I subscribed to the policy platform of the Green Party – “three Yeses”. I will use these statements as starting points for explaining my views. Out of the three, I was and still am most interested in the first yes. The European Union – in line with the global economic system – is a neoliberal institution that too closely aligns national governments within and into this orthodoxy. The reforms necessary to shift the EU and its institutions towards a radical progressive platform with redistributive tackling of inequality at its heart are sizeable, and I understand the scepticism of some about the ability of nation states, political blocs within the European Parliament and individual MEPs, never mind national polities (e.g. the UK public), to enact radical reform easily. Nevertheless, it seems to me that the alternative to this priority – giving up on the European project in its institutional/democratic spheres as a lost cause – is so much worse, particularly for a country with the colonial history and isolationist tendencies of the UK that has still sat in a prominent place within European politics. It is not just the economic settlement where I would like to see reform. I think the democratic understanding of most people in the United Kingdom of the procedures and processes of the European Parliament is poor to non-existent. I see the need for legislation in the UK Parliament (perhaps in reform of the BBC charter and the way the media works generally) to ensure that EP sessions are included regularly on national media and on channels such as BBC Parliament for people to understand how democracy works in the European system. The European Parliament – on paper at least, if not in its perceived distance from the UK public – is a MORE democratic institution than the UK Parliament in pretty much every single way. This diagram explains this better than I can. So, yes to reform of Europe, with UK MEPs and the people playing a strong, organised role in pushing for reform. This is what, I hope, would have happened if the referendum had gone a different way. It’s to the referendum that I now turn. Ironically, given the current positions of both parties, the Labour Party was not offering a referendum on our membership of the EU heading into the 2014 European elections and the 2015 General Election and the Green Party was. At the time, the Labour policy struck me as being quite anti-democratic. My view then was that: a) people who had never had a say on our membership (i.e. who weren’t alive or old enough to vote in the 1975 membership referendum) should be able to have a say on it now and b) that if the vote – as I think most people expected – returned a Remain vote, that that would put the issue to bed for another generation, which in my eyes would mean we could focus more closely on more important things – like campaigning for EU reform, introducing proportional representation, taking bold steps to fight against climate change, and tackling income inequality and the housing crisis. I can already hear people screaming “hypocrisy!” at me. How can I be in favour of the result putting the issue to bed if it went the way I wanted it, but not be willing to accept the result if it went the other way? It’s a fair criticism, I suppose. At the same time, if people in UKIP (and eurosceptics in Labour and the Tories) had continued to campaign against our membership of the European Union after a Remain vote, I would not have thought that was anti-democratic or poor form, just a bit eccentric. That is completely up to them and it is a vital aspect of our democracy that people believe strongly in something (however much I think it is unimportant or settled) to continue to campaign for what they believe in. I would of course have supported the UK government (ugh!) in (presumably?) ignoring their pleas. And so now that we have had a Leave vote, there is nothing to stop Remainers from continuing to call for what they want: to Remain in the European Union and for a referendum on the terms of the negotiated deal. a) The referendum question was a simple yes/no question, which does not lead to a firm conclusion as to the method of the UK leaving the EU. b) The referendum was not legally binding in the same way as the Scottish Independence referendum was. This means that although different sides would need to accept the stated democratic will of the vote, the final settlement of the exact kind of exit from the EU was not clear. This calls into question whether the vote can be meaningfully called a democratic expression of the will of the people, as there was not a detailed picture of what leaving the EU would mean in practical outcome for the UK. c) The Electoral Commission has ruled that the Leave campaign broke electoral law. This casts doubt over the whole referendum as a democratic procedure. d) As there was a previous referendum on the UK’s membership of the EU in 1975, there was now a precedent set constitutionally that the UK does not see membership of the EU as a “once and for all” vote, allowing subsequent votes. e) The circumstances and specific content of the terms of UK exit are yet to be decided and, democratically speaking, if the public has had a say over WHETHER the UK should leave, it should also get a say over HOW the UK leaves, given the numerous options (no deal, hard, soft and remain after all) that will present themselves when the Government finally reveals the deal it has got with the EU. My priority in politics reads thus: what position and politics will lead us – at the local, regional, national, continental and global stages – to tackle climate change and social inequality effectively? I do not believe that the UK can tackle climate change without cooperation, dialogue and international working as part of the EU. I also trust the European Parliament and EU to bring in strong legislation on climate change more than I trust the current UK government to do similar. Other European democracies have a better record than the UK does on this. We need a seat at the table and to be able to use our voice for change in that institution. As a cooperative, democratic institution, the UK is a vital peace project. Some of its economic and social policies are downright terrible – on Greece, or on the refugee crisis, for instance – but I believe the sum total of our collective wisdom needs to be supported in its institutional form, even while we criticise and attempt to reform its flaws. It is clear that the Conservative Party is split on the EU still, and continues to procrastinate, argue and muddle through. MPs who campaigned to Remain are now adamantly for the hardest of Brexits because they are scared of the 10% or so they gained from UKIP in 2017 going back to them and stopping them from being the largest party at a subsequent general election. Irrespective of this, the Tories are in a bind anyway as, if the economy collapses if we leave the EU (whether no deal, hard or soft), it will be them who will be clearly shown to be terrible at handling the economy. The Labour Party is also split on the EU, but their muddle-through is slightly easier because they are in opposition, they improved their position in the 2017 general election, and their party leader is seen as at best a “soft remainer” and at worst an “ardent Eurosceptic Brexiteer”. The difficulty they have is there are a majority of Labour Party members – on the left, centre, right, and wherever else – who are intelligent, see the EU as an important institution for the aims of international social democracy and solidarity, and have noticed that the polls show regret over the Leave vote (see image below), with the majority of Labour-held constituencies now being in favour of Remain. This means that Jeremy Corbyn, who – if you remember – immediately called for the triggering of Article 50 on the day after the referendum in June 2016, finds himself on the wrong side of his party membership, the voters he needs to convince to continue voting Labour at the next general election, and the public at large. Refusing to support a People’s Vote on the final Brexit deal may not ultimately prove to be his undoing, due to the weak, divided leadership of the Tories, the economy cratering and – to be honest – a bunch of people who will vote Labour whatever, whether out of fear of the Tories, support of a local candidate, or as “the only progressive option”. This is what Corbyn supporters perceive as “playing the long game” in terms of strategy. The difficulty with this strategy is clear. Firstly, Corbyn will continue to be attacked on three fronts: by the Conservatives and other parties, by non-Corbynist MPs and members in his party, and by influential media sources who support the continuation of Conservative government. On the first, he may develop some good lines and play the same timid game Labour always plays in opposition of slowly winning trust in the country (this is for people who don’t realise or understand what a calamity Brexit would be). On the second, he will struggle – as we have seen with the anti-Semitism row. And on the third, he will without the tabloid press (and, let’s be frank, a positive media profile and perception that he is a moderate) find it hard to win over that extra 3-5% in the so-called centre ground of British politics that saw Tony Blair deliver two landslide election victories. Even as a leftist, I do not believe that the Labour Party just serves people who have leftwing politics. It reaches parts of the country my own party cannot yet hope to reach and we need it to continue to do so, at least for the timebeing. As a Green, I find it more and more perturbing how easily some of Corbyn’s supporters gloss over the gap between Corbyn’s “straight-talking, honest politics” and the fact he doesn’t have straightforward answers on whether the UK will be better off economically outside the EU. We won’t be. Even the Government’s own forecasts show we won’t be under three different exit scenarios. If Corbyn is such a change from the norm, why can’t he just say “the forecasts show that we might not be better off, but if we are elected after Brexit has occurred, we will have to do our best with the situation we have inherited from the Tories”? Why is such an idealistic movement as Momentum prepared to put up with such a lack of idealism and leadership? And how will this help Labour’s electoral chances if they enable the Tories in pushing through whatever Brexit they negotiate without a chance for the public to say “nope, this will make things worse in every way”? So, in summary (and quite obviously), I support a People’s Vote, I think the Labour Party needs to support it, I think Labour should have a strong Remainer who is on the left or soft left of the party as their leader, and I think only these outcomes will potentially stop economic catastrophe, further years of even worse Tory austerity and even more time wasted in tackling climate change and the unequal economic settlement that Corbyn and his supporters say they want to radically reform. As a resident of Lawrence Hill ward, I am particularly concerned by the missed opportunity building the Arena in the centre of Bristol will have on communities here. I do not believe that the siting of an Arena is a panacea for this deprivation and the wider income inequalities in Bristol and the UK. However, if we think for just a few seconds about the kind of work that will be made available by this development – regular work in the service and hospitality industry – this is exactly the kind of role suitable for people who are long-term unemployed and with skills and education deprivation. This shows that the siting of the Arena will have a substantial and direct impact on the cost and desirability for Lawrence Hill residents taking jobs at the Arena. Additionally, the anti-social hours that employees of an Arena may need to hold are not necessarily conducive to the use of public transport. The Arena Island site represents a substantial opportunity for residents in deprived areas like Lawrence Hill (as well as other areas of inner city Bristol, both north and south of the river) to access good-quality jobs within walking, cycling and public transport distance. I hope that the Labour Mayor of Bristol, Marvin Rees, considers the people who need jobs most before he decides to move the Arena project away from these employment-deprived areas. Author robertjessetelfordPosted on January 31, 2018 Categories UncategorizedLeave a comment on The design and application of neighbourhood planning in England acts effectively to constrain local autonomy and inhibit public participation in planning. Discuss. 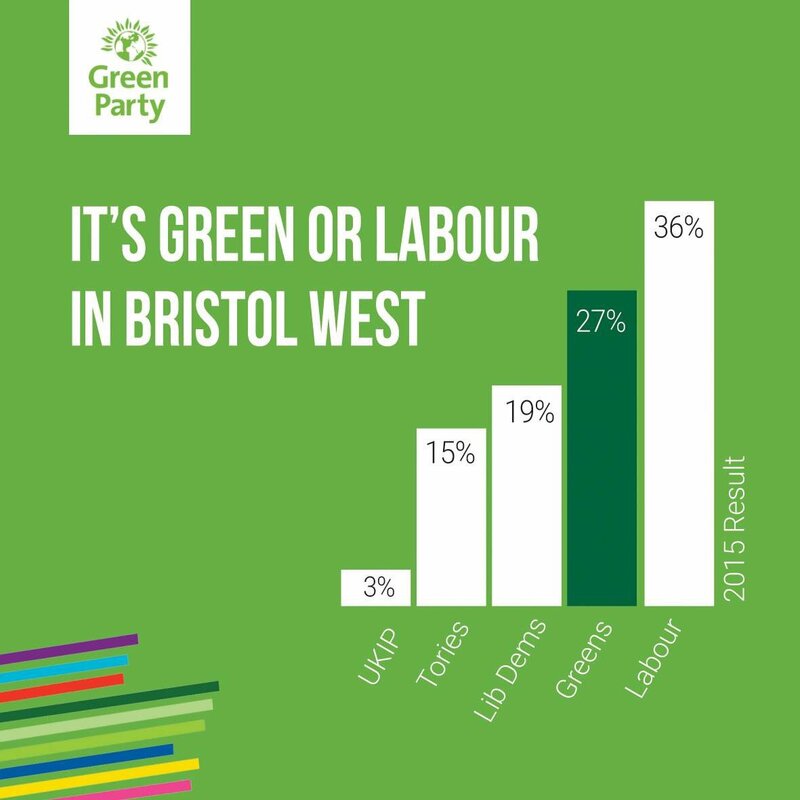 We’ve already knocked on thousands of doors in Bristol West in this campaign, and the most common reaction we get is “we must keep the Tories out”. As Greens, we agree. As a party, we have led on attempts to negotiate deals in seats the Conservatives hold or threaten to take without a strong, singular progressive-minded voice on the ballot paper. 1. Labour just beat the Greens last time leaving the Lib Dems and the Tories in a distant third and fourth place. 2. Even if the entire UKIP vote from 2015 went to the Tories, they would still be in fourth. 3. 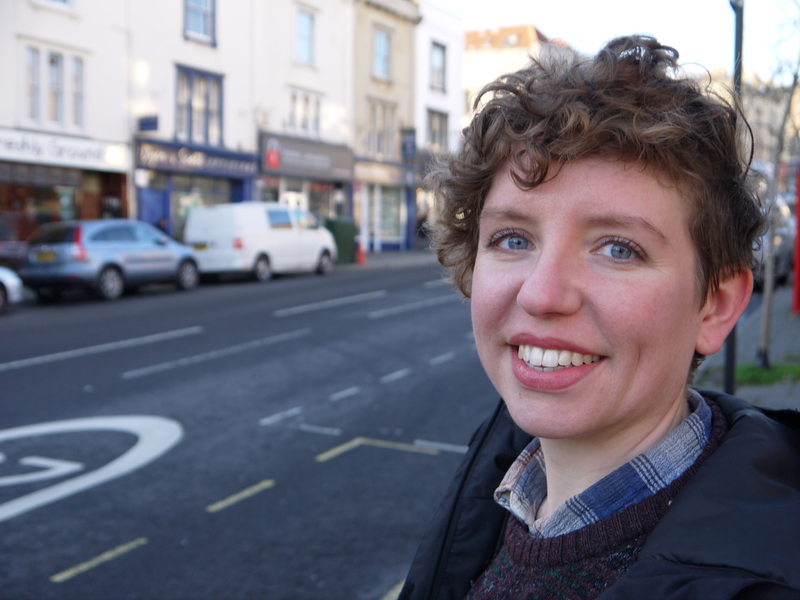 The Tories cannot win this seat (and won’t be attempting to), so progressive voters can back the Greens and make history by electing Bristol’s first Green MP. A Green MP would work cooperatively with other progressive MPs but hold Labour to account where the party’s policies veer away from the progressive values this constituency holds dear. A Green MP would campaign for a final referendum on the negotiated terms of Brexit. The Labour Party are not in favour of this referendum, preferring to let Theresa May push through her plans rather than let the people decide. A Green MP would campaign to halt NHS privatisation and invest in our health. The Labour Party did not back Caroline Lucas’ NHS Reinstatement Bill and during the last Labour government, began the process of privatisation through PFI schemes. A Green MP would campaign for a fairer voting system to make votes matter. The Labour Party are divided on the issue and have made no clear statement that they would change to a proportional voting system. 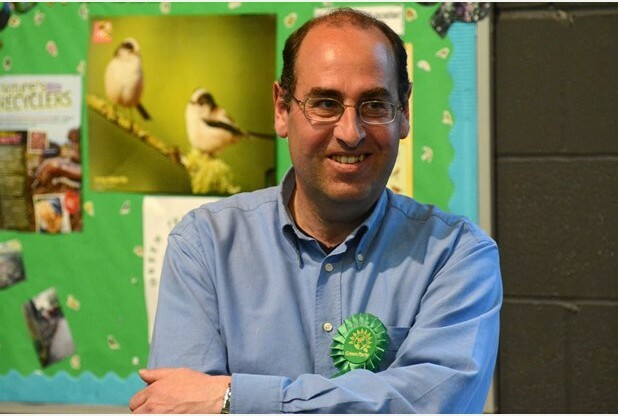 A Green MP would campaign for action on climate change. The Labour Party barely ever mention climate change, the country’s greatest threat to security. A second Green MP would do more to push a Labour or Conservative government to do what is right by providing effective opposition and critique when it matters. Theresa May does not want another Caroline Lucas in Parliament. She does not want Molly Scott Cato to be elected – an economist who can lay bare the inadequacies and falsehoods of the Conservatives’ disastrous economic policies. 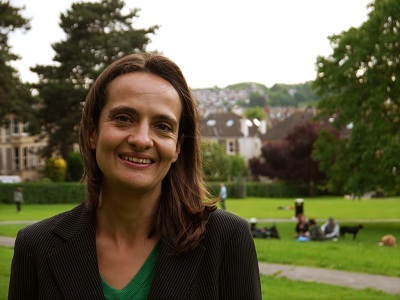 If you want a future to believe in, it’s time for a Green MP in Bristol. I’ve known Tony for quite a while. 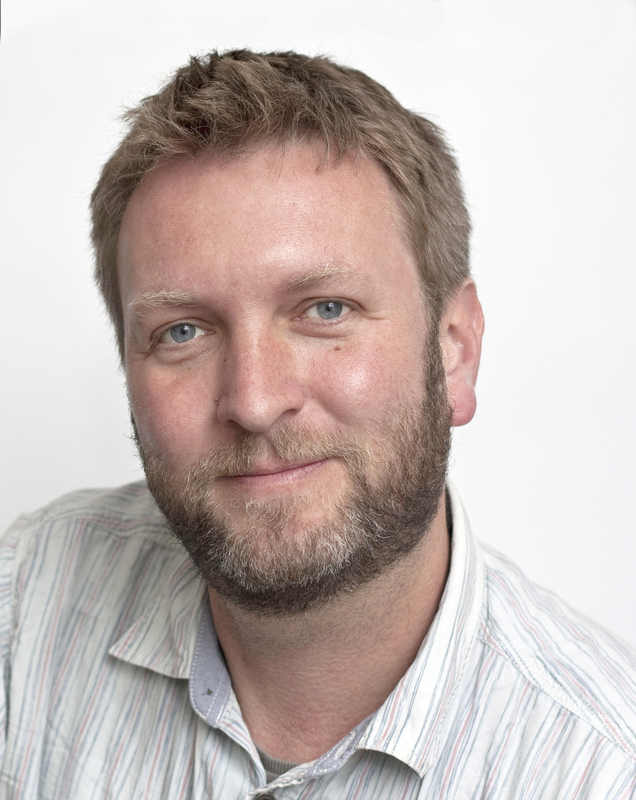 I can’t remember exactly when I met him, but like many people in the Bristol blogosphere I was impressed by his incredibly detailed writing for a previous incarnation of the website Bristol 24/7. He clearly puts the time and effort in to understand a subject. It might not seem like a big deal, but Tony reads books, and he learns things from them. I think this is hugely important in terms of the over-arching reasons for voting for him. Intelligence, principle and pragmatism are Tony’s chief qualities – he knows the issues inside out, he knows what the right thing to do is on those issues, and he knows which issues it is realistic to focus on for his term of office. Let me tell you more about Tony. Tony is a kind, genuine, funny and down-to-earth person. He is undoubtedly a policy wonk, but he wears it lightly…and anyway, since when was it a bad thing to know what we should do to make things better? When he suggested his idea for an immediate call for George Osborne to allow us to keep our business rates in Bristol (already Osborne’s policy, but Tony would negotiate speeding the process up in exchange for freezing council tax, a Tory sacred cow), it would free up millions of pounds he could then use for infrastructure spending. In an era of Conservative government-imposed austerity, we need someone who has genuinely tried to think of alternatives that are achievable and workable, who isn’t just accepting austerity as a necessity, and who knows what he wants to get out of central government. Tony is well-liked by people, even his political opponents. He is known to be straight-talking with everyone he meets, frames all of his conversation positively and doesn’t belittle others – in fact, he believes he needs people from all political persuasions and none if there is any chance for economic, social and environmental justice to be advanced in any meaningful way. 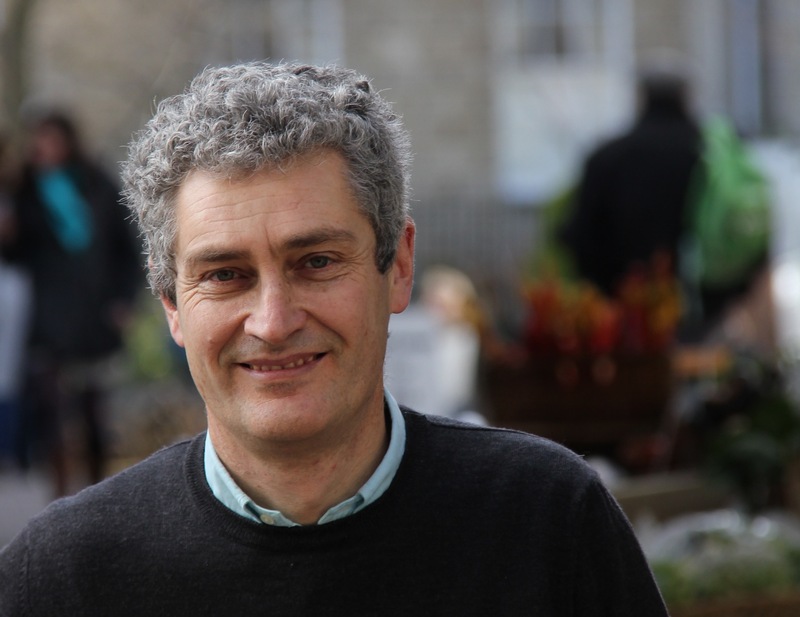 If elected as Mayor, he would be collaborative to a far greater degree than any of the other main candidates, utilising his Cabinet’s expertise in far deeper ways than is presently being achieved, listening to communities first rather than imposing solutions straight away, and – yes, it’s important to acknowledge, given the other candidates’ situations – being consultative with the local Green Party, who will hold him accountable for his decisions on a regular basis through our democratic structures. The media had formed their narrative on this mayoral election campaign before it even started. 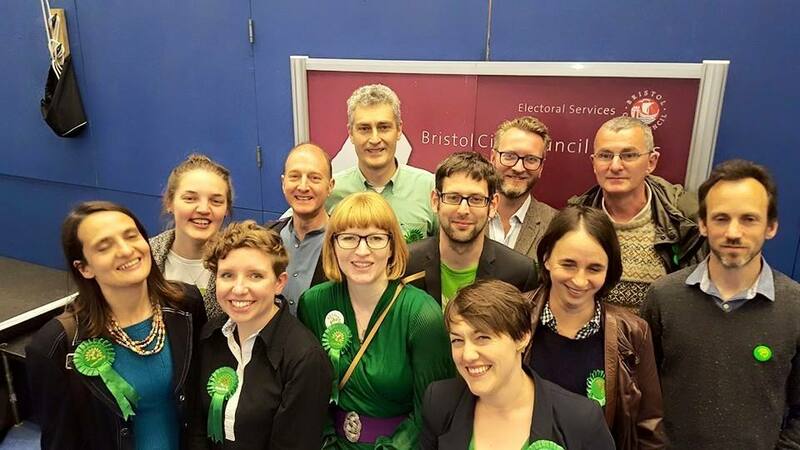 For them, it was between Ferguson and Rees again…and they seemed to be ignorant of the large increase of the Green vote share year after year in Bristol. Another jump, and we will get a Green Mayor. This would cause a national shockwave in a way that no other half-likely result will and will instantaneously make Bristol the most progressive and forward-thinking city in the country. And just one more thing. You may be aware that the voting system for this election allows you a first and a second preference. That means you can vote for who you really want to win first, and who you would put up with second. Above all, Tony really needs your first preference – so put #TonyFirst! At a City level I have been working with the Green Party Transport Group to propose Transport policy and campaigns for 2016. With that group and with the Green Party councillors we have been looking at Air Quality in Bristol and have proposed our approach for the launch of a low emissions zone in central Bristol. We will be consulting on that with Green party members in the coming weeks. In Clifton we have been progressing an enhanced role for Clifton Library. On Tuesday 6 October we held a very well attended Friends of Clifton Library meeting. This was led by local Green Party member Paula O’Rourke. I’ve been working with John Grimshaw (founder of Sustrans) on his proposal for a zebra crossing on Jacobs Wells Road and better access onto Brandon Hill. I’ve also met with the council’s cycling officers about the unacceptable life risks to cyclists on the Jacobs Wells roundabout and have proposed a number of measures, some of them very low cost, which will reduce those risks to acceptable levels. The main issue locally has continued to be the Carriageworks (Westmoreland House – the derelict building on the corner of Ashley Rd and Stokes Croft). The developer Fifth Capital London has worked closely with the community liaison group (CAG) since their planning application was deferred at committee in April. This leads many to believe the development is likely to go ahead despite 25 years of set-backs. The main concern is that there is local representation on a future management committee so that future use is in keeping with the Community Vision. The decision is going to planning committee on the 14th October. Following on the housing theme, I was the only councillor not on Place Scrutiny to attend an excellent full day for the Bristol Housing Enquiry where we explored the situation in Bristol and looked to other authorities and organisations to see what they are doing around the country to solve the housing crisis. Prior to this I joined other councillors and members for the formulation of the Green Housing Policy working group which met for an evening to discuss what our short, medium and long term goals need to be within the city. This will feed into the Mayoral Manifesto for next May’s elections. Earlier this week I also met with local campaigners who want to solve the growing problem of homelessness faced by the city. The aim is to creating temporary shelter leading to continued support to those who have found themselves in the downward spiral of homelessness. The main problem at this stage is lack of suitable buildings available and I will be working with Cabot Cllr Ani Stafford Townsend as this issue crosses both our wards. Likewise litter, fly-tipping and the general rubbish on our streets is continuing to be the number one complaint, and rightly so. Lower Montpelier and St Pauls are continuing to be blighted by a dismal street-scene and it is hoped that now the waste contract is brought back ‘in house’ that some progress can be made. Interestingly, we are being approached by residents in St Andrews asking for an extension to residents parking as the displacement of extra and commuter cars are spreading further north now the zone is active in Montpelier. 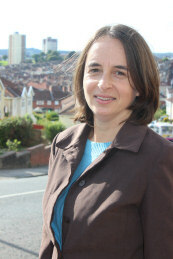 Rather than summarising a whole month, this time here’s a day in the life of Cllr Carla Denyer. This was 7th October, slightly busier than the average day, but far from unusual. 11:00am-12:00pm – Met a business-owner in my ward to address waste collection and fly-tipping issues on her property, complicated by neighbour relations. One of them did not take kindly to being asked well-meaning questions… sometimes being a councillor entails being a counsellor too. I am now following up on the issues with the Waste Services team. Redland councillors are now grappling with continuing problems over the Bristol North Baths Redevelopment (a new library, medical centre, flats and toilets above the car park on Gloucester Rd). Since the Medical Practice serving most of Bishopston announced they will no longer seek to relocate there many questions have come up. While the plan adopted was controversial and some residents are saying now is the time to revisit the shape of the project, with a close to completion development it makes sense to get the best from the investment, protect the council’s interests as freeholder, and ensure local medical services are not jeopardised. We want our local library to open and Drs to have a base with more facilities. We are pressing hard for the long awaited proposals on review of the new Residents Parking schemes to be published so that those affected by the commuter parking around our current zone get a solution, and the proposed minor changes to the existing scheme can be implemented. There is widespread support for the scheme now in place and many outside it are very keen to see parking managed. We’re committed to getting as many local residents and traders’ ideas incorporated as possible so the scheme is shaped by people using it. Months ago the Gloucester Rd and many other local streets were resurfaced. We are still pressing for reinstatement of all the markings which still fail to restore the cycle tracks that provide some protection for cycle users on the city’s busiest cycle road. Although I haven’t had any major papers to take to cabinet this month, it hasn’t been that quiet. I seem to get about 100 e-mails a day, a variety of issues relating to my portfolio, dealings with officers and of course ward work. This week I spoke at a conference on rethinking parks, attended a celebration of the Playing out charity and also chaired a meeting of the partnership advisory group for Muslim women which is planning a conference for Muslim women next year. As part of my role in Sports I am helping convene an open space session to help start a women’s sports strategy for the city next month. Part of my work involves being part of the sports commission shadow board which is setting itself up as a community interest company. 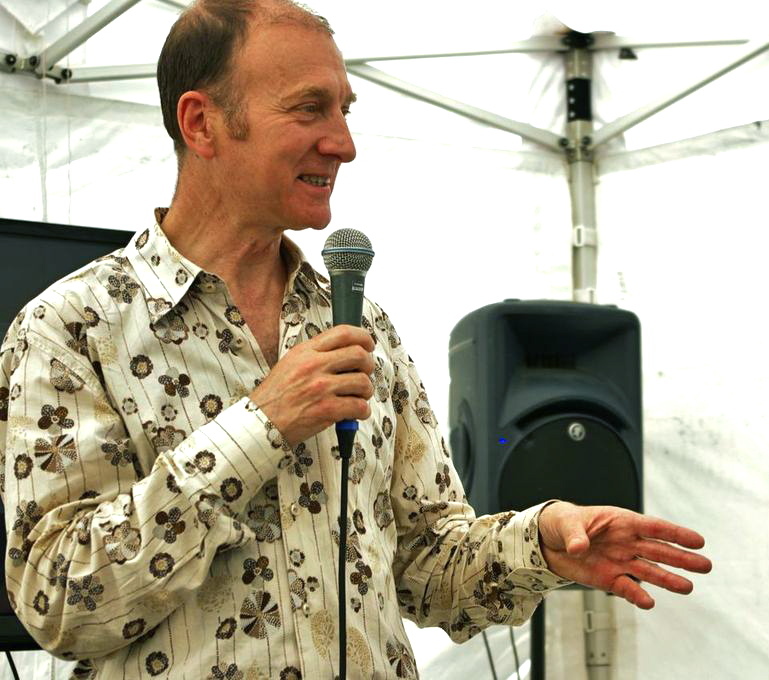 I am also now the Green representative on the Bristol Cultural Development Partnership that runs the festival of ideas. I have attended a number of council and commission meetings (including a cabinet meeting on 6.10.15 where I asked a question about the environmental sustainability of the Arena). There was a very informative Housing Inquiry Day (with four separate briefing meetings beforehand) where councillors, experts and officers discussed innovative ways for Bristol to try and tackle the housing crisis. I met an interesting delegation of citizens from Hanover (one of Bristol’s twin-towns) and discovered that they have many of the same problems that we do; public transport, air-quality, lack of really affordable housing etc. I enjoyed meeting them and they loved Bristol. Finally, myself and Charlie Bolton (co-councillor for Southville) are continuing with our initiative to talk to the voters in the nine tower blocks in our patch by having regular surgeries. The biggest issues are dog-free blocks and illegal tenancies. Generally the residents are very pleased to see us as they have been ignored and forgotten for a long time. The big event for me this month was the Cabinet meeting where the Mayor took the decision on the future of Bristol’s Libraries. I gave a speech summarising how we got to where we are, and published it on our website (see above for link). The headlines that are that we have reduced the scale of the cuts to the libraries and are keeping 27 out 28 libraries in their current locations and moving one into Lockleaze. Regrettably, there will be reductions to library opening hours across the city, but with the libraries being kept open, there is potential to increase their accessibility in time. This has been a really difficult time for me, like many of us I have an emotional connection with libraries I hate to see reductions in opening hours. However, money is tight and having been given an insight into the looming impacts of welfare reform, the government’s policies on right to buy and rents, on top of more spending cuts, I know that from a council perspective things are going to get more and more difficult over the next few years for the most vulnerable people in our city. As well as attending council meetings and his committee meetings (Business Change Scrutiny, Human Resources and Appeals Committees), Steve has had a busy month dealing with a number of urgent local issues. The longest running issue on the table is the terrible traffic problems that are already being created by the new stadium at Ashton Gate (even though it is only half-built. Steve is a lifelong Bristol City supporter so he is enjoying watching the the brand new 27,000 seater stadium rising from the mists of Ashton but he (and most of the residents) have no idea where all the cars are going to go. There is no local Metrobus stop, no new Ashton Gate train station, Long Ashton Park and Ride is closed during match times (yes really!). Meanwhile, hundreds of cars cruise around Southville and Ashton and residents cower behind their net curtains… Anyway, Steve and Charlie are trying to help. They have met the Mayor for a one-to-one, met Bristol Sport’s MD (who was incredibly frustrated with the council), started a petition and are generally creating a stink. Another issue that has just flared up is Ashton Gate Primary School. This has just opened in a new site with a lovely new school and extensive playground. The trouble is that there is a road between the school and playground. Unbelievably, no one has bothered to put a zebra crossing, bollards or anything else to stop the local cars ignoring the 20mph speed limit and potentially mowing down the little ones. Not surprisingly, the local parents are apoplectic and we have received lots of irate emails. Again, we are trying to get urgent changes to the road layout. Finally, we are continuing with our initiative to talk to the voters in the nine tower blocks in our patch by having regular surgeries. Generally the residents are very pleased to see us as they have been ignored and forgotten for a long time. I’ve been working on some ward issues, especially calling for an RPZ in Windmill Hill ward and asking for more public consultation on the Arena and sustainable transport plans for accessing Temple Quarter from Bath and Wells Roads ( a neglected route in my opinion). I’m the vice-Chair on People Scrutiny where we (Dani Glazzard and I) are focusing on mental health and early years provision. The re-commissioning of the children’s community health services is a major topic now that the only NHS provider has withdrawn from the contract for next year. I am looking at ways to ensure that NHS bidders are encouraged in the longterm. I also sit on the Police and Crime Panel which scrutinises the Police Commissioner. This is quite controversial since the Chief Constable was suspended and has now been asked to resign. Councillor round-up…in Easton, Cllr Anna McMullen has been promoting jobs fairs and meeting with local landlords about provision in the private rented sector…in Clifton, Cllr Jerome Thomas is helping residents who would like a community centre in the Jacobs Well Road area…in Redland, Cllrs Martin Fodor and Fi Hance have been frustrated by the slow progress on the Bristol North Baths development…in Cabot, Cllr Ani Stafford-Townsend has been encouraged by community days and is monitoring closely the extent of student accomodation being proposed in the ward…and finally, in Ashley, Gus and I are pleased the Carriageworks Action Group (CAG) have got many concessions from the developer, Fifth Capital London, before it is due back to the planning committee in October, and we have more and more people approaching us from St Andrews and St Werburghs asking for Residents’ Parking Schemes to be introduced (as a result of the knock-on effect of recent schemes in St Pauls and Montpelier).